A prospective customer came to us with a custom door dream.--a leather door for the family Media Room. 176 hand covered and hand tufted buttons later, they have this one of a kind door. The push plate side of door. Custom tufted leather door with custom installed trim and hardware. What a beauty she is. Part of the process to reach fruition. Kim's true labor of love for the work she does shows her perfectionism and dedication to the customers she serves. By the way....did we mention...CUSTOM! Health care establishment requests custom removable protector for a chair. Kim gives them exactly what works for them. It is easy to clean and impermeable to fluid leakage. Great for any nursing home or home health agency...or your home if needed for child or elder care. Custom top for a Trike. Amazing area we live in! 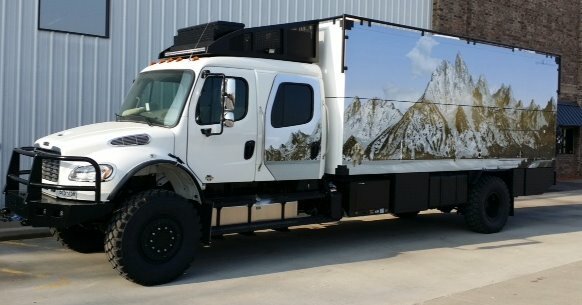 Jack's Upholstery LLC had the privilege of doing some custom work for Global Expedition Vehicles. This company was the dream invention of Michael Van Pelt. Production began here in Nixa in 2008. They have been featured on the Travel Channel and in various magazines and newspapers. They are the "out of the ordinary" and "go anywhere" travel expedition vehicles, built to be self reliant and all custom to the specification of the owner. This is their Patagonia Model, customized for a couple taking to the mountains. Check out Global Expeditions on Facebook or the Internet. They have a neat story and a super unique invention. We appreciate the opportunity and privilege to be a small part of their amazing process.